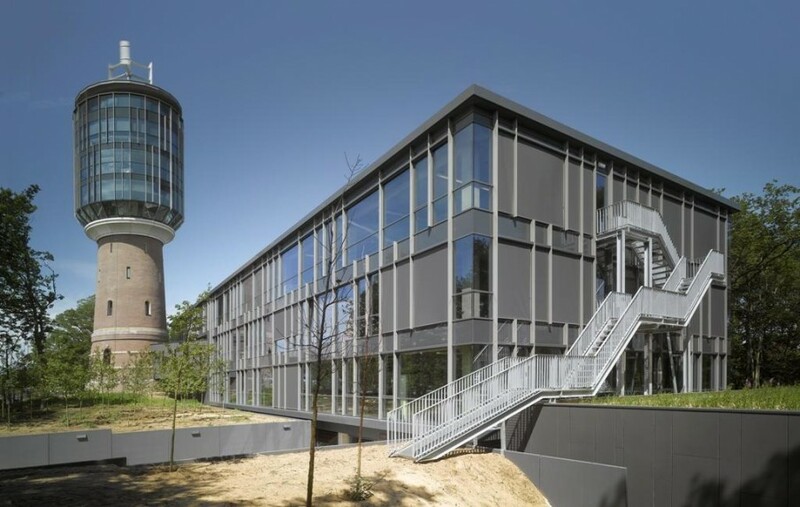 The project comprises of the most sustainable office building in the Netherlands: the Bussum Water Tower. 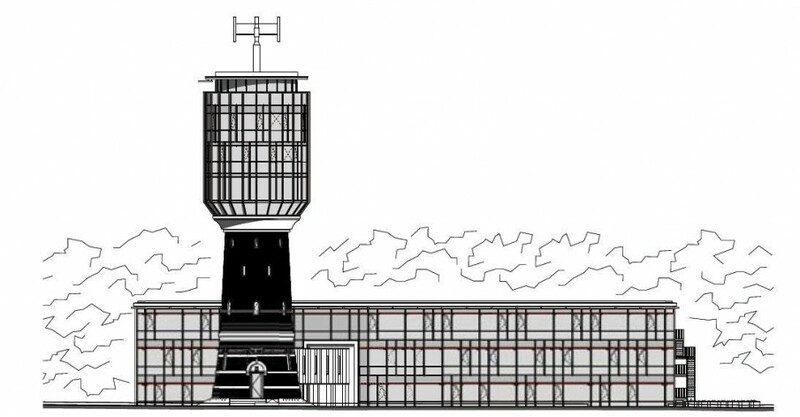 The project comprises the renovation of the former water tower from 1897 and linked to that, a new office building with a total of approximately 3,500 m2 of gross surface area. The initiative was taken by professor Michiel Haas of the Dutch Institute for Building Biology and Ecology (“NIBE”) and ir. Bob Custers of VOCUS architecten bna in 2004. Together with their property advisor mr. Maarten A. Smits MRE of Sixpence and investor Meeuwsen Ten Hoopen (MTH) represented by drs. Sjoerd Riedstra and drs. Rutger Kuipers, the project has turned into a big success. The belief in sustainability, vision and decisiveness has proven that it is possible to execute a sustainable building plan, even in economically difficult times. 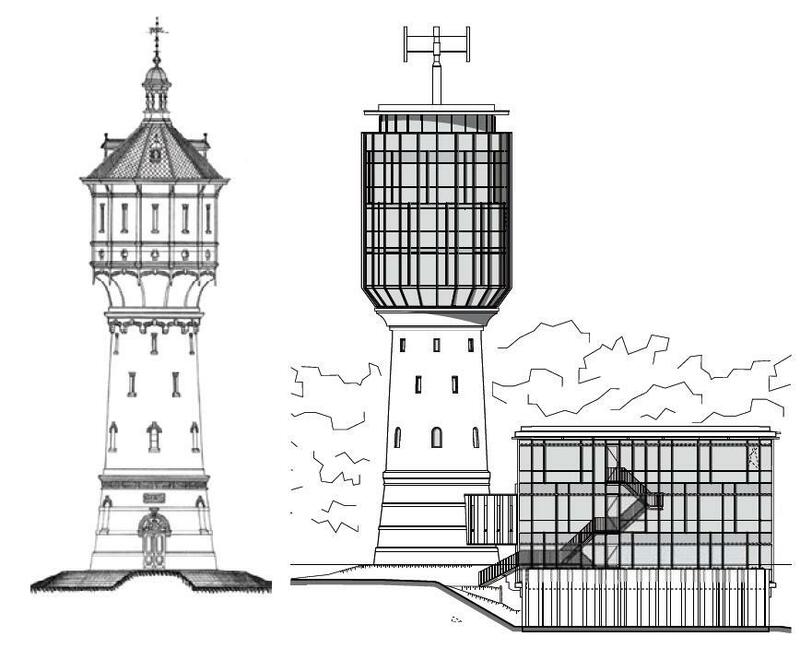 The neglected water tower from 1897 was an architectural challenge for Haas en Custers. A famous Dutch comic duo once referred to the corrugated aluminium shell of the reservoir as 'the watch stem of the Netherlands'. This has now gone. The modern interpretation of the original water tower has a glass top, accommodating a number of meeting rooms and offices. 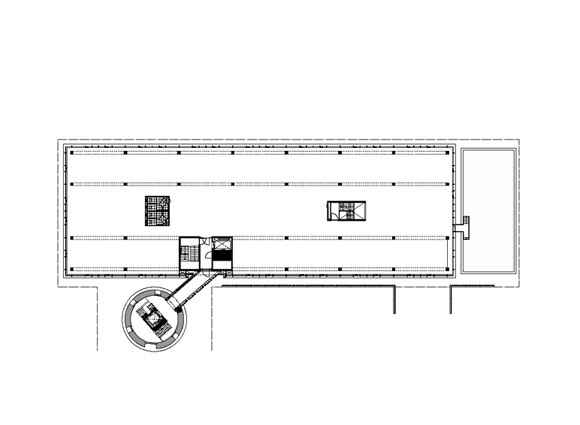 The tower is linked to a low-rise glass pavilion which houses 85% of the offices. A total of approximately 100 people work in the entire complex. 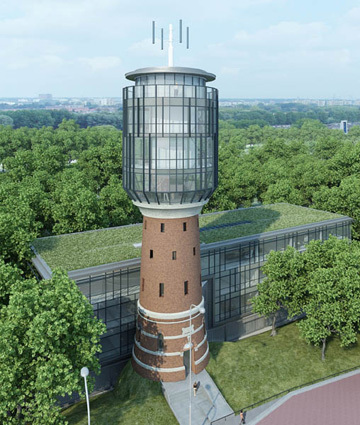 As such, the Bussum Water Tower landmark has been restored to its former glory. met by the cogeneration system, which, along with the concrete core activation, can heat up the entire building. In extremely cold conditions, stored heat in the soil is used for top heating, but the system also has cooling options. Cooling is also controlled via the cogeneration system by means of an absorption refrigeration machine that can convert heat into cold, and stored cold in the soil. When cooling, the cold is also taken from the building via the concrete core activation in combination with ventilation. This is why the building does not need a gas connection. 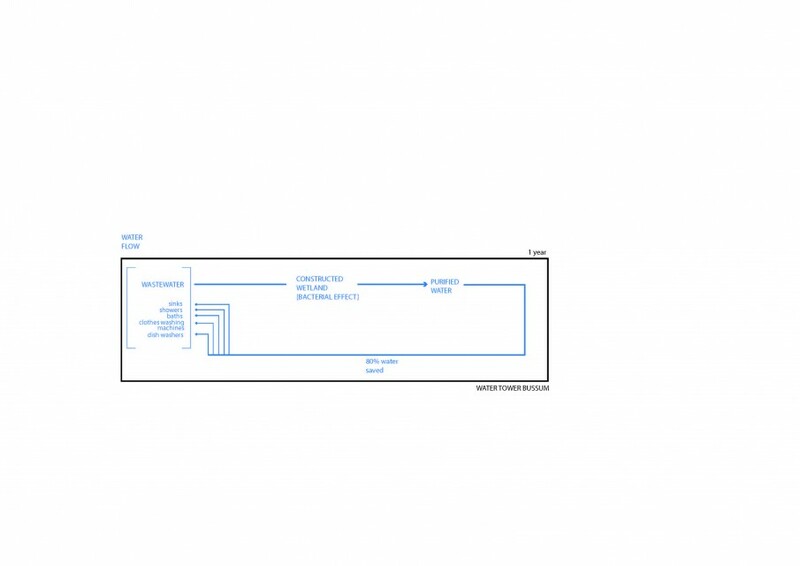 All of the required electric energy is generated by the internal systems. This is done by means of wind energy, PV cells and the cogeneration system. A small windmill has been installed on top of the tower. It is expected to generate approximately 8,000 kWh on an annual basis. This figure cannot be exceeded due to dynamic forces. Approximately 30 m2 of solar panels have been installed and they are expected to generate 3,200 kWh per year. That means that the cogeneration system is expected to produce another 110,000 kWh per year. As such, the building will be entirely self-sufficient in terms of energy supply. As the cogeneration system is fired with vegetable waste oil (domestic and industrial), it does not put a burden on farmland intended for food production. Neither does it contribute to the greenhouse effect: plants absorb CO2 and emit this when they rot or when burned. It means this CO2 does not contribute to the greenhouse effect, unlike fossil fuels which are currently emitting CO2 that was stored millions of years ago. However, as the waste oil is transported by trucks that do emit fossil CO2, extra energy must be produced, more than is consumed to compensate for those CO2 emissions. Only then can a building claim to be a zero-energy or climate-neutral building. That is the case here. Water plays a particular role in the project. 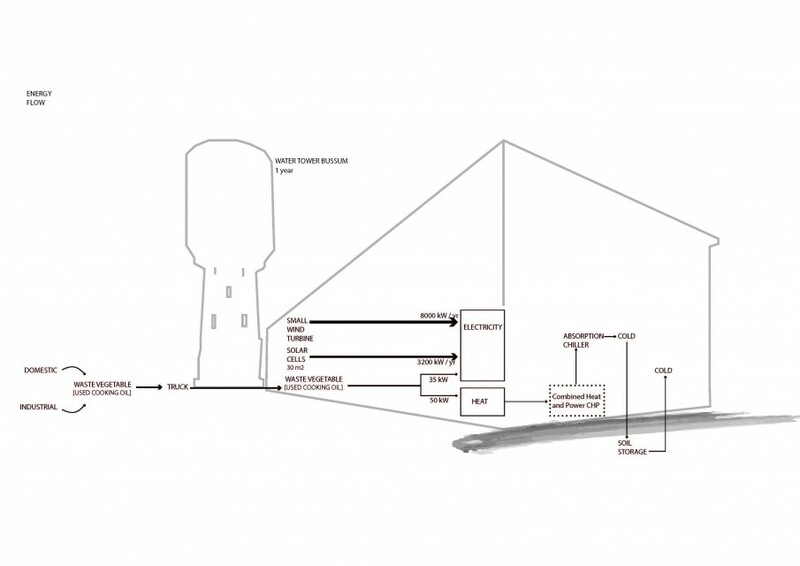 First, it concerns a former water tower, which was sold by PWN Noord-Holland in 1996. 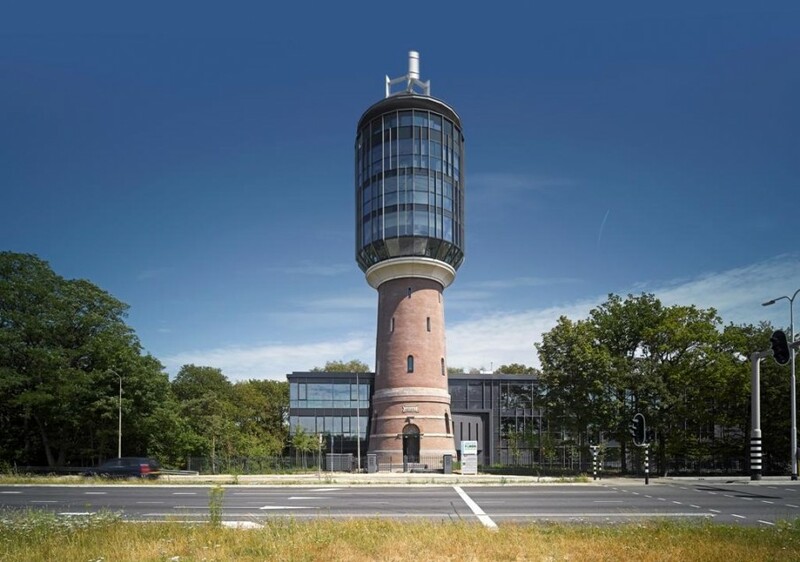 The tower supplied Bussum with water for a great number of years. Second, the tower stands in a former water extraction area, and the groundwater sits at extremely great depths. This made it possible to partially sink the building into the ground. And last but not least, it has its own water and sewage treatment plant. This makes it a truly unique building. The initiators show that this project is also extremely environmentally friendly in terms of water consumption. All the internal wastewater, including faeces, is treated internally which is why the building is not connected to the sewer. Wastewater is treated by means of a helophyte filter. 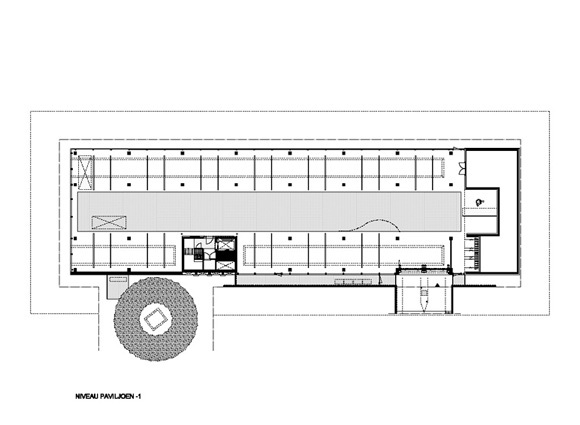 The filter has been structurally integrated and forms an architectural element of the building. The treated water that comes out of it is reused to flush all of the building's toilets. This saves 80% of the drinking water consumption, at the same time creating a minor water cycle with small amounts of drinking water being supplied by the water company. Helophyte filters have not been applied in Europe on such a scale before. With this, we demonstrate that it is feasible to biologically and ecologically treat water in projects. Sustainability can be measured. 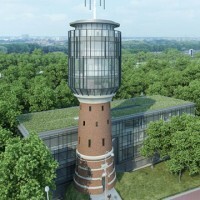 The Bussum water tower project claims to be the most sustainable office in the Netherlands ever realised. This claim is substantiated by a figure, an Environmental Index for Buildings ("MIG") of 1028. According to the Ministry of Housing, Spatial Planning and the Environment, it appears that the higher the score, the less environmentally harmful a building is. The highest score so far (323) was achieved by the offices of the Directorate-General for Public Works and Water Management in Terneuzen, followed by the offices of the WWF in Zeist with a score of 269. This measurable unit of sustainability is calculated with the GreenCalc+ LCA program, a computer program that makes a lifecycle analysis of an entire building. On the basis of a schedule of requirements or the work carried out, GreenCalc+ can calculate the sustainability of a building. This is done for three aspects: materials, energy consumption and water consumption. These are measurable units, whose sustainability, the environmental burden, can be measured. Central government has stipulated that the government has to make 100% sustainable purchases in 2010 in order to promote a sustainable society. In consultation with all national offices and private sectors, SenterNovem has laid down those criteria for sustainable purchasing. One of the provisions is that if a building meets a GreenCalc+ (or "MIG") score of 200, sustainable purchasing is achieved. The Bussum Water Tower exceeds this level considerably. Because the tower was built in a forest, the construction site was kept as small as possible. A second, temporary construction site was set up across the road. During the construction process, most of the elements were prefabricated. As part of the sustainability concept, the focus was on industrial, flexible and demountable construction. A well-organised construction process also prevents a lot of waste streams and the need for auxiliary constructions. The concrete structures of the annexe were manufactured by Hercuton. Concrete elements arrived at the construction site one by one. The structural phase took up only four months. The steel structure was manufactured across the road, by Broeze Nijverdal. On 14 November 2009, the top was lifted onto the base in a single movement. Terberg Systeemintegratie of IJsselstein realised the sustainable water and electrical systems. Various specialist companies such as AEH Power (cogeneration system), Duratherm (thermal energy storage), Ecofyt (helophyte filter), Ropatec (windmill) worked under them.ration system), Duratherm (thermal energy storage), Ecofyt (helophyte filter), Ropatec (windmill) worked under them. Klodiana Millona Water plays a particular role in the project.